Today we begin our new session with Good Morning Girls in the book of Exodus! Welcome back to Blogging Through the Bible here at Grace-Filled-Moments! 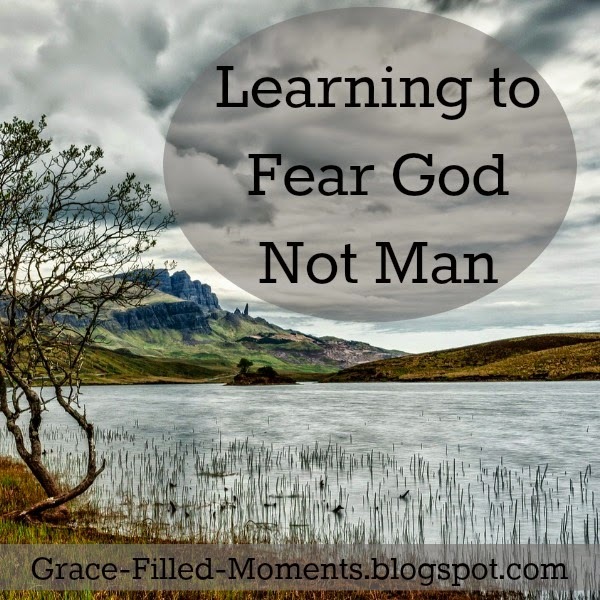 The first lesson we can take away from today's chapter is learning to fear God not man. This lesson is so very important if we want to walk obediently with God. There is a new Pharaoh in Egypt. One that knows nothing about Joseph. He is threatened by the Israelites' presence in Egpyt. He's worried about the mighty number of Israelites that have now outnumbered the Egyptians. What if, he thinks, a war erupts and they join the enemy and fight against Egypt? Pharaoh's fear leads him to a gruesome plot to kill every newborn Hebrew baby boy. A plot he makes into a decree. Pharaoh's decree to kill every Hebrew baby boy wasn't only given because this was a man who thought his power was being threatened. This was one of many plots by Satan himself in which he sought to destroy the promised Seed we read about Genesis. The Hebrew midwives are the ones forced to fulfill this decree. 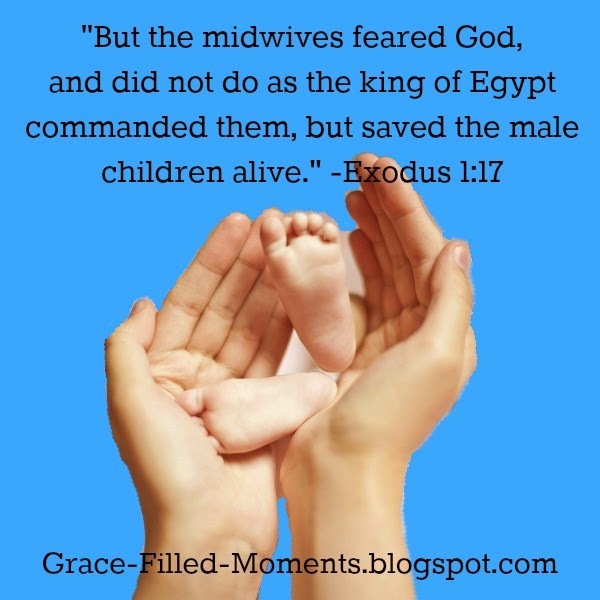 In chapter one of Exodus, we meet two Hebrew midwives who decide to fear God not man. They take their stand with God, willingly putting their very lives on the line, in order to walk in righteousness before their God. Hebrew midwives, according to Biblical scholars, were Hebrew women who were unable to have children of their own. So in order to have a place in society, they were given the responsibility to assist pregnant women in the birthing process. In Moses' retelling of this event in Exodus, chapter one, he specifically mentions Shiphrah and Puah...two Hebrew midwives that refuse to comply with Pharaoh's decree. We are told why they refused this royal decree in verse 17. ...and a change in our world! Are you ready to be a world changer? It will begin in your home, sweet friend. It will begin as you daily sit at the feet of Jesus, soaking in the Word of God and allowing God to change your own heart. As we begin this new session with Good Morning Girls, our Bible study method changes slightly. You will now see me sharing my S.O.A.K. with you. Here is what this acronym stands for which is replacing the S.O.A.P. I shared with you in our last session. I hope you'll join me as we read through the book of Exodus in January and February, along with the Good Morning Girls. Courtney has a Bible reading bookmark for your Bible as well as an eWorkbook for Exodus that you can download for free if you'd like to use them. Observations: The Hebrew midwives, Shiphrah and Puah, disobeyed the royal edict from the King of Egypt to kill all the newborn Hebrew boys as soon as they were born because they feared God. This signifies they had a personal relationship with God. The word “feared” used in verse 17 comes from the Hebrew word “yare” which means “to fear or to revere”. Strong’s Concordance defines “yare” as “used of a person in exalted position, standing in awe, not a simple fear but reverence whereby an individual recognizes the power and position of the individual revered and renders him proper respect, in this sense the word may imply submission to a proper ethical relationship to God”. They risked their own lives in order to save the lives of these innocent baby boys. These two women were called by God to help deliver precious lives. Who is to say that they did not have a hand in delivering the deliverer of the Hebrew people – Moses, whom we’ll read about in our next chapter? Some Biblical scholars believe that midwives were barren women, who desiring to have a place in society, were given the responsibility of helping pregnant women bring life into the world. Shiphrah and Puah were blessed with families of their own because of their obedience to God. Application: As righteous women, we too are called to fear God above what man can do to us. If we are ever asked to do anything that goes directly against what we know the Word of God says, then we are to be obedient to God and live as He calls us to live. Doing so may cost us our very life as we take our stand with God, but we are assured in His Word that we will be present with Him (2 Corinthians 5:8). There are blessings of God to receive for living in obedience to how He calls us to live. Kneel: Heavenly Father, I pray for the strength and courage to stand in obedience to Your Word in a world that grows more hostile every day toward everything You stand for. You alone are worthy of awe and respect. Man may be able to kill my body, but You hold my soul in Your mighty hands. May this truth direct my steps as I seek to live in obedience to You. In the powerful name of Jesus I pray. Amen! Will you be joining me as I read through the book of Exodus with Courtney Joseph at Good Morning Girls? I'm so happy to be Blogging Through the Bible with Courtney Joseph of Women Living Well, home of Good Morning Girls. Please click on the image below to read more Blogging Through the Bible posts from Courtney and others. good stuff to start the year off with. God must be listening because I have been praying for a while asking to be in a deeper relationship with Him. Hi, Amy! Great to see you here! God loves you Amy and He desires that deeper relationship with you too! Praying for you as you seek to grow closer to God this year. Hi Laurie! I just discovered your blog through twitter! I'm also doing the blogging through the Bible series! It was so nice to be able to read your posts and see your outlook on this also. I really enjoyed that you posted your soak for the day! I just started my own blog this year over at http://faithfilledfeathers.blogspot.com/ I would love for you to stop by and let me know what you think! Thanks so much for sharing your blog with all of us! Welcome, Hannah!! I'm so glad you are here and are blogging through the Bible too! I would love to check out your blog...thanks for sharing your link! I love how your blog looks! Love the way you laid out your post too! Glad to be following you!